· Electronic Design Services: Systems, Stand-alone Devices, Single boards, Firmware / Software, etc. 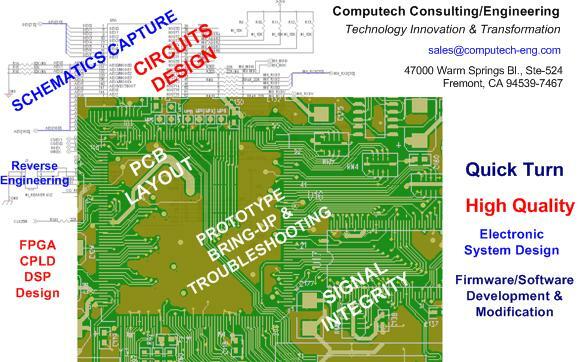 · Circuits Design Services: Schematics, FPGA / CPLD / ASIC / DSP Designs, Networking, Industrial Control, etc. · 2-D & 3-D Mechanical Design: AutoCAD, Solidworks, AnSYS, etc. · PCB Layout Services: Controlled Impendence, High Speed Signal Integrity, etc. · Prototype Production Services: Assembly, Bring-up and Troubleshooting, etc. · Desk-top computers, Notebook Computers, Mother Boards & Add-on cards Repair or Replacement.